Encore Photo Booth is a fun company in Michigan that provides photo booth rentals for both large and small events. We have help guests strike at pose at wedding receptions, high school proms, corporate functions, and private parties. Our Michigan Photo Booths are provided by Encore Event Group, and we are looking forward to helping you capture the memories. 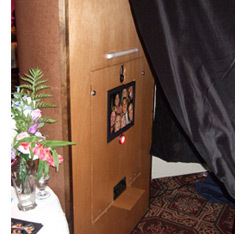 Photo booths make sense at formal events where you can save time and money. For example, if you are planning a wedding reception, you can skip the favors and go with a photo booth instead. Not only will you save some money, but you will also give family and friends a fun and creative way to express themselves. To top it off, we can even help you with scrapbooking your photos. How fun is that! We have tons of great options for clients, so take the time to browse our site. If you would like more info then check your event date on the right or call 877.643.8368. Let us help be part of the success at your upcoming celebration.